They get out of the car faster than you can count them and run cheerfully around to find the perfect spot to do what any dog has to do before hitting the road. They don’t mind one bit that it’s raining cats and – well, dogs. Except Frank the Mops who’s not feeling great and he doesn’t really like the rain. Frankly, Frank prefers to be carried instead of getting his tiny feet wet, but today he’s quite happy waiting in the car. The others will tell him about their adventure when they get back. As for the rest of them, the forest is at their feet. Dog paradise. 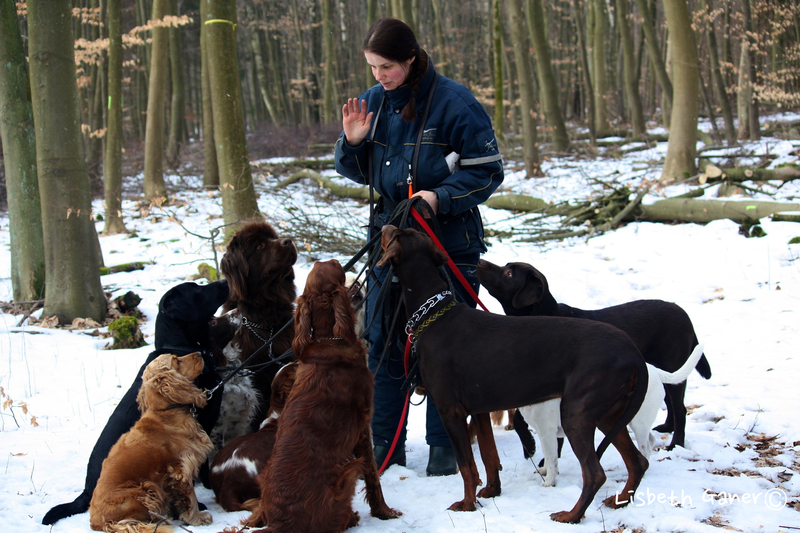 Walking calmly in the middle of nine dogs is Ingrid Johansson from Sweden, dog walker, dog trainer and most importantly dog lover. She’s in complete control, leashes and a whistle dangling around her neck. The only one on a leash is Lennox, a young German shepherd who is quite new to the group. He’s doing just fine, but he’s still a bit cocky as youngsters often are, and he needs to learn how things work in this neck of the woods. And Ingrid needs to learn how he will react in any given situation. There’s Maya the vegan dog, old Mama Wilma and capricious Coco – don’t come too near. The Irish setter is greased lightning between tree trunks, whereas the golden retriever will check on you to make sure you feel included in the group. Two of them put raincoats on this morning – one’s got too little hair and gets too cold, the other one has too much and gets too dirty. Ingrid too knows how to dress for an extremely rainy day in the forest; practical from her ponytail down to her wellies. She’s done this for eight years now, besides she’s Scandinavian. And she wears a smile which it takes a lot more than bad weather to wipe off, in fact according to Ingrid, there is no such thing as bad weather. Except for the occasional storm or a major snowfall that will stop her car from taking her where she wants to go. The driver of the tow truck who once came to her rescue had certainly never had to tow a dog house on wheels before. Ingrid’s own dog, Wilma the Labrador, is living proof of this, trotting off to bed as soon as she’s done her job joyfully greeting a visitor to their Limpertsberg apartment. It’s spacious and nicely decorated, letting a lot of light in, exactly what a Scandinavian wants. And quite a contrast to forest life, but then Ingrid prefers urban living with easy access to nature. In between sips of tea, Ingrid talks. Mostly about dogs, sometimes about other things. Her Luxembourg story is quite a familiar one, at least to begin with. Her husband got a job here, and they left Sweden to live in Luxembourg for 3 -5 years. This was back in 1999. She worked in private banking for five years, and then two things happened. Job related stress caused her blood pressure to rise to unwanted levels, and her first dog, also a Labrador called Unni (yours truly is deeply honoured), passed away at age 11. Enter Wilma, a puppy who was home alone with more energy than what’s good for a house. Her doctor asked the trigger question. And so it was that eight years ago, Ingrid started the first kindergarten for dogs in Luxembourg. Not just like that, back then it took about a year to go through the paper mill and get a business permit. Ingrid also felt she was frowned upon being a woman starting up her own business, a very strange business at that – crazy lady! As it turned out, Ingrid wasn’t crazy, and the grapevine worked. Her full time kindergarten filled up. But running a full time kindergarten is stressful too, and after 6 years Ingrid decided to do only dog walking. She keeps the same dogs on a monthly contract, with very few newcomers. That creates harmony in the group, the dogs listen to her and she has a personal contact with each one of them. They even learn a bit Swedish. Capricious Coco has been with her for eight years, others for six or seven. By the time Ingrid has fetched all the dogs in Bourglinster, Itzig, Sandweiler, Limpertsberg…, walked them and taken them home again, she’ll have had a 5 hours’ work day. Perfect for a mother of a five year old boy, naturally a dog lover like his mum. “My son was born in dog hair”, she laughs. “I believe that keeps him healthy and less prone to allergies, plus he has a natural way with animals, like when he’s riding”. Ingrid herself wasn’t born in dog hair; she didn’t even grow up with dogs in the idyllic town of Kalmar in southern Sweden. 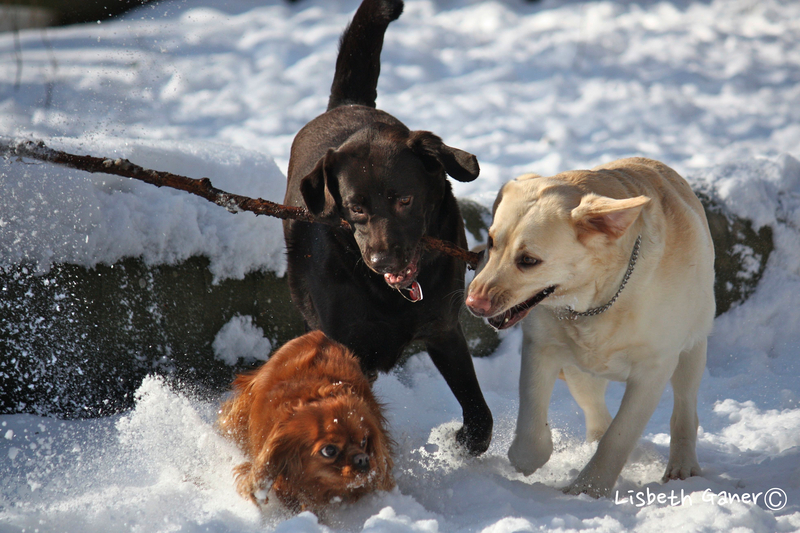 She doesn’t miss Sweden, except for how they feel about – well, dogs. Take any topic of conversation, and Ingrid will quickly find a way to get back to dogs. She’s also proud of the Scandinavian breeding programmes, securing mentally strong dogs. 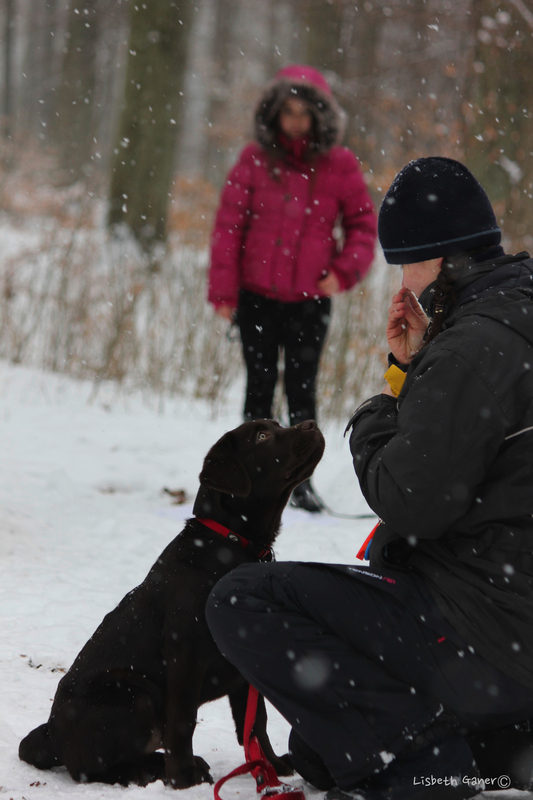 Ingrid is a certified dog instructor doing puppy classes and general obedience classes on week-ends, using gentle, positive methods, always emphasizing the contact with the dog. She observes cultural differences there as well, like which nationalities will show up even if the weather is really bad, and which won’t even if it’s not that bad. She makes sure to teach new dog owners what it actually involves to have a dog. In Ingrid’s ideal world with dogs, there would be laws on how to transport a dog safely, the police would react when stray dogs pick a fight with other dogs or scare people, flexilines would be banned so they won’t cause whiplash, and prong collars would be banned too. After eight years with dogs, a regular job like the one she used to have would feel like a prison. She’s not in it for the money, at the end of the dog walking day she’s left with +/- 0. To make money, she’d have to take on so many dogs that she’d lose that valuable personal contact. Instead of colleagues to exchange ideas with, she has other dog lovers joining her for her forest walks. 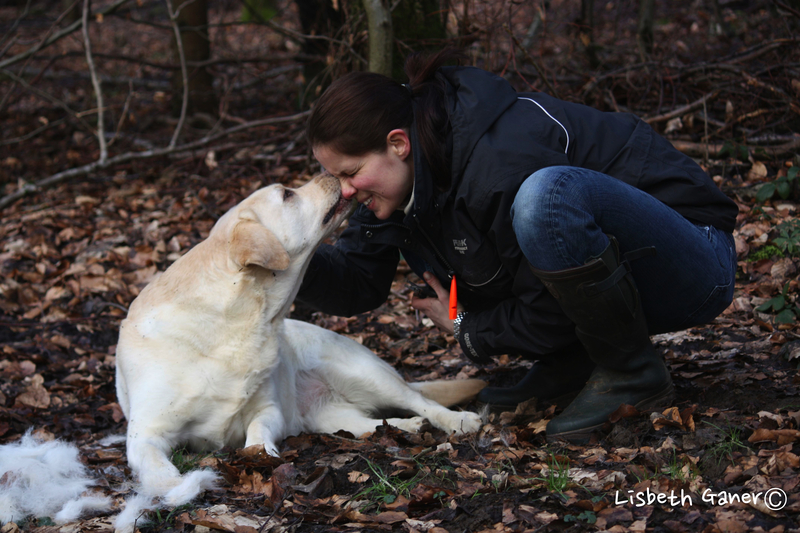 And if you’d like to get a dog, Ingrid will gladly recommend the Labrador – gentle, easy and clean. Just look at Wilma, best dog in the world. Some breeds will drool too much, others will be really hard to keep clean, be too nervous or eat way too much. Ingrid will know them all. Thanks to her own passion, to an always supportive husband – even when he stumbles over dogs – and to the generous life in Luxembourg, Ingrid has the possibility to get paid to do her hobby. She feels fortunate that she can. And there are some very fortunate dogs out there in the forest too. « Care for your colon!